Does flour go bad is a very pertinent question; yes, it certainly does. This page was last updated by Dr Barrie Lewis on 30th March, 2019. One hundred percent whole wheat contains a huge number of vital vitamins, minerals and fat. Once the kernel is cracked and air can get to these components, oxidation begins; in short, it goes rancid, and relatively quickly; within days. The food manufacturing industry's solution is simple; remove these substances. So most wheat foods are either 100 percent extraction which means that all the bran and wheat germ are removed, and it's often then also bleached to make it super white; perfect for the unwitting and unconcerned housewife. Or, 60 percent extraction flour is used, meaning that 40% of the goodies have been removed. In practice that means that over half of the B vitamins and minerals are lost; interestingly, they go to animal food where it's described as a "wastage product" of the milling industry. So too the bran is removed; it's the insoluble fibre that gives the stool bulk, making it easy to pass. Whilst I don't believe in adding extra to our food, the natural bran in one hundred percent whole wheat has been shown in research published in the journal Diabetes Care to greatly reduce metabolic syndrome and insulin resistance. In short, even the most common whole wheat foods, having in reality less than 50% of the real stuff, are denatured, dangerous and fattening. Does flour go bad, yes it certainly does though keeping it in the freezer gives some protection. It's the oils in the wheat germ that go rancid; in nature, and in our bodies, these fats are protected against the air by an anti oxidant called vitamin E; remove it and you have the answer to the question does flour go bad? Yes, it certainly does. The upper part in the graphic above is 100% wholemeal; the lower half is described as wholewheat on the bag but as you can see is a very different kettle of fish. When these rancid and oxidised oils enter the body, their toxic waste products attack the inner lining, or intima, of our blood vessels causing a disease process called atherosclerosis that progresses to high blood pressure, and heart disease. Therein we sit on the horns of a dilemma; we buy and use one hundred percent whole wheat flour that was milled certainly weeks and perhaps months previously, but it's now loaded with the oxidised breakdown products of fats going rancid. Or we eat refined flour that has much of the valuable part removed. The solution comes in two parts. Find a source of recently milled flour, and insist on one hundred percent whole wheat. Keep it in the freezer. Accept that we are no longer going to use refined, bleached white flour in our cooking, at least not in major proportions. Neither of these may be palatable to us; then we have to accept a certain future of high blood pressure and heart disease, and the growing incidence of diabetes in our world. 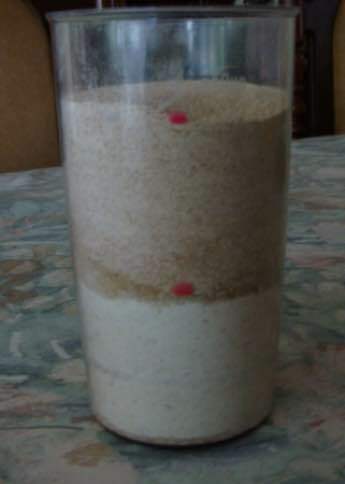 Freezing your wholewheat flour in an airtight container certainly helps; the whole oxidative process is slowed. Refined white flour has no nutrients, other than starch, so there's no point in keep it in the fridge; there's nothing to go bad. Lignans are a phytochemical that have a structure similar to oestrogen; they are broken down in the bowel to form a compound called enterodiol that research has proved gives protection against many cancers, including the breast and prostate. Does flour go bad is one part of the story. Lignans are found in large amounts in whole grains and seeds. White flour has none, they go as a wastage product to keep animals in fine fettle. 100% whole wheat, and sesame and flax seeds too, have large amounts of lignans. You'll find the sesame seeds once hulled in the freezer in shops; if not avoid them. Expect to pay a lot more. Inflammation is another area of great interest to chiropractors and their patients. Research published in the American Journal of Clinical Nutrition, proved that apparently healthy individuals eating a diet low in choline and its breakdown product betaine had 20% more low grade systemic inflammation in their bodies. This has profound implications for those chiropractic patients who find they have multiple sources of pain in their bodies. Their back and necks, shoulders, knees and feet all seem to hurt. Choline is found in eggs, tofu, 100% wholewheat, spinach, beetroot and swiss chard. Less low grade systemic inflammation translates into less back pain, fewer headaches and a lower level of inflamed blood vessels. If you're interested read the abstract in AJCN entitled dietary betaine and inflammation. What is betaine is a subject we should all have some understanding of if we have angry and inflamed bodies. It's indisputable now that women for go on to hormone replacement therapy have a much higher incidence of breast and uterine dread disease. Interestingly, these women, if they enjoy high fibre diets, especially from grains and fruit, have a fifty percent reduced rate of breast cancer, when compared with those who ate the least fibre. Again the dilemma lies in the question does flour go bad; remove the bran, vitamin E and fatty fraction and the risk of CA rises sharply. This is particularly true of Combi HRT which contains oestrogen and progestin; never use it except in extreme circumstances, and make sure you are getting plenty of fibre in your diet. An electric wheat mill is the answer to the question does flour go bad. Yes, healthy flour certainly has a shelf life, unlike the refined product that keeps for ever, but gives us nutritionless, tasteless bread; worse, in order to make it edible we have to smother it in processed meat polonies and hams; that too means a high risk of malignancies. I could go on ad nauseum about the proven benefits of 100% whole wheat on gallstones, obesity, constipation, asthma, diabetes and a host of other diseases; it's all in the scientific literature. If you're still unconvinced on the value of an electric flour mill and the five minutes you will have to spend baking your own bread every day, then read more at heart stroke diabetes. Rather than suffer from these maladies, we decided to make the considerable investment in a wheat grinder, to purchase whole wheat grains and daily grind flour that would go bad if kept on the shelf, except that it is immediately used. That decision meant also a conscious decision to reduce our white flour consumption; my wife tells me that we have used one and half pounds of the refined stuff in three months. I like it in the batter for my fried eggplant, and she bakes cakes and scones very occasionally. One doesn't want to become a nutcase, but these things are important. Compare that with 3/4 pound of whole wheat flour in each loaf of low GI bread that I bake daily. That's 70 pounds in three months. We purchase four 50kg sacks of whole grain wheat directly from the farmer every year. We bought the grinder twenty years ago; it's definitely paid for itself many times over. Neither of us take any drugs or have any health issues, in our early seventies; but that's an anecdote of course, and of no real scientific value. Still, a life without medication is our dictum. Does flour go bad and the antioxidant vitamin E are fundamentally linked. The antioxidant vitamin E is found in eight different isomers, all of which are important for human wellness. In this instance it's these properties that are so important in helping prevent flour from going bad. In the refining process both the germ, including vitamin E and fatty acids, and the bran is removed. Isn't it odd that weevils have no interest in refined flour, and it has an indefinite shelf life? All the goodness is gone, either added to animal fodder or turned into expensive bran and softgel capsules and sold back to us at great profit. Choline and chiropractic surprisingly are synergistic subjects; they are both in the business of reducing inflammation in the body. It's a central subject in answering the question does flour go bad. Choline is now recognised as a B vitamin that your body cannot synthesize and you must have daily in your diet for optimal health. It has many functions but one is the synthesis of an enzyme vitally important for methylation of a very inflammatory breakdown product of protein metabolism called homocysteine. It's central in many illnesses including Alzheimer's and cardiovascular disease. 100% whole wheat is an excellent source of choline but most of it is in the bran and germ; once it's refined it has little value to us. The hogs get the benefit. The average Western diet has less than 50% of the required choline; it's one of the main reasons why there is so much inflammation in our joints, muscles and organs; hence our interest as chiropractors. Your chiropractor can reduce the subluxation of your joints, a major cause of generative arthritis, but it's your responsibility to make sure your homocysteine levels are kept low by consuming foods rich in the B vitamins; there's more information at choline food sources. Wheat berries are subject to attack from two different sources; first weevils, and secondly moisture. The solution is to freeze them for at least ten days, and then seal them in airtight containers. We have a dedicated freezer into which large buckets of the wheat berries go; they are then removed and taped to keep air and moisture out. The freezing process with kill any weevil larvae. Ground wholemeal flour can be kept in the fridge for a maximum of seven days, and in the freezer for six months. 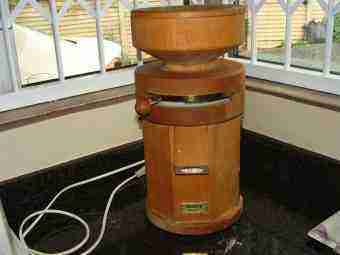 However, my best advice is to keep the mill on the countertop and use the flour immediately it's ground. There's little to be gained by refrigerating and freezing, and much to be lost. 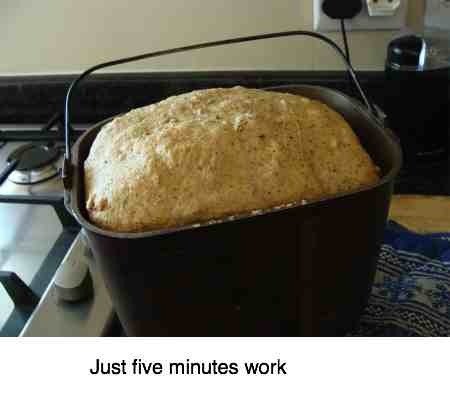 This is easy sourdough bread recipe if our favourite, made with 100% freshly ground wholemeal. Intolerance to the gluten in wheat is of great concern to many, and rightly so. However, the avoidance of whole grain products should also be of concern; it contributes directly to a significantly higher rate of heart disease and the many conditions associated with constipation. There is a solution for the vast majority of gluten sufferers; enjoying bread that been exposed to a sourdough culture for a prolonged period. That means baking it yourself, unless you have a very unusual and unique baker around the corner. I reiterate; it takes me only five minutes daily to prepare our sourdough loaf using our own freshly ground 100% wholemeal 'real' bread, at a fraction of the cost if you can get the wheat directly from the farmer. If you suffer from inflammatory bowel disease, then the dough has to prove for 24 hours; prepare it today for tomorrow's loaf. You may need to change to the one of the heritage varieties of spelt or einkorn. Chiropractic Help › Healthy Flour › Does flour go bad?